Guests return again and again to this lovely flat which has views of the little steam train and the mountains along the Glaslyn valley. Larger than most South Snowdon Wharf apartments after being converted from a two bedroom duplex apartment to one bedroom and a fully functional seperated kitchen. Comfortably prepared by its proud owner it has a large lounge and balcony. 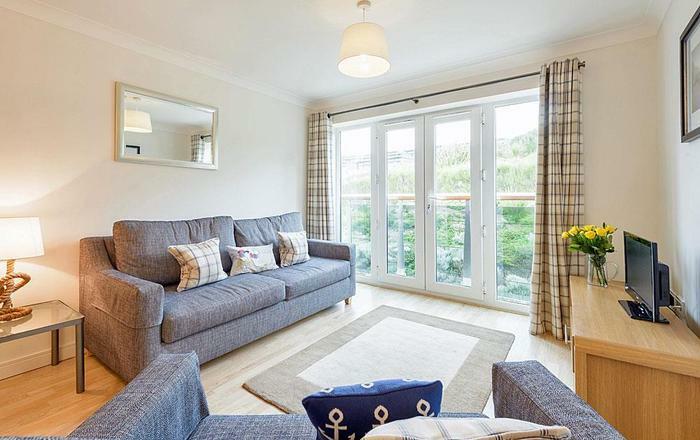 Occupying two floors (the first and second) it is in a quiet location just five minutes walk to Porthmadog town centre and next door to the famous Ffestiniog Railway narrow gauge steam train station. Access to the front door via a flight of external stairs. 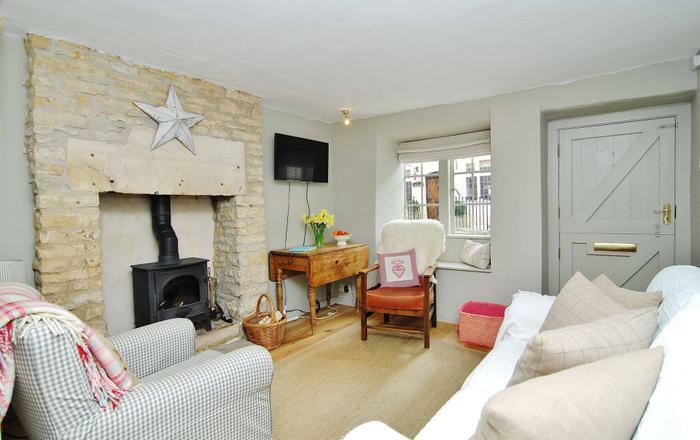 It is only a short walk to the local shops, restaurants and leisure centre from the apartment. 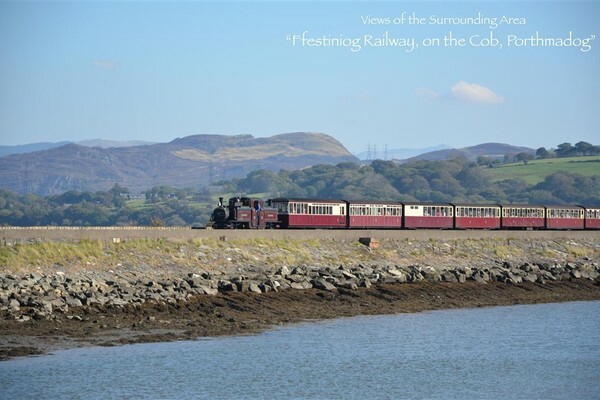 The station for the Ffestiniog and Welsh Highland steam railways is right outside from where you can enjoy a sedate journey through the Vale of Ffestiniog or the Aberglaslyn pass or just sit on the balcony watching the comings and goings on the platform. This is a good central location for a holiday property in North Wales. 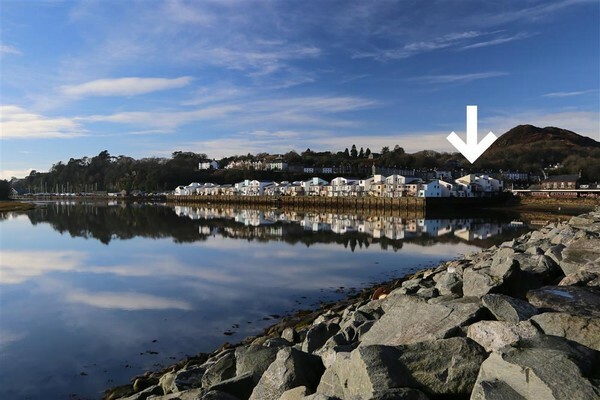 Easy access to sandy beaches at Borth y Gest (15 minute walk) and Morfa Bychan's Black Rock Sands (2 mls), Snowdon and the pretty village of Beddgelert are 7 miles. Portmeirion village with its prestigious hotel and gardens is 2 miles. Cricieth, Harlech and Caernarfon are just a few of the castles in the area. 1 BEDROOM: 1 Double bedroom on the second floor with a small TV. Bed linen, towels and tea towels provided. SHOWER ROOM: Electric shower with WC (on the second floor next to the bedroom). KITCHEN: Completely renewed recently with electric hob and oven, fridge/freezer, microwave, dishwasher and washing machine/dryer. LOUNGE: Freeview 32" TV, DVD and electric fire. PATIO: Balcony with furniture and flower tubs. PARKING: Allocated parking for 1 car outside the apartment. HEATING: Night storage heaters in bedroom and lounge. WiFi: We recommend using WiFi at Spooner's Bar or one of the cafes or pubs on the high street, as this property does not provide WiFi access. NEW FOR 2019: New curtains in the lounge, new blinds in the bedroom and black out curtains in the bedroom. 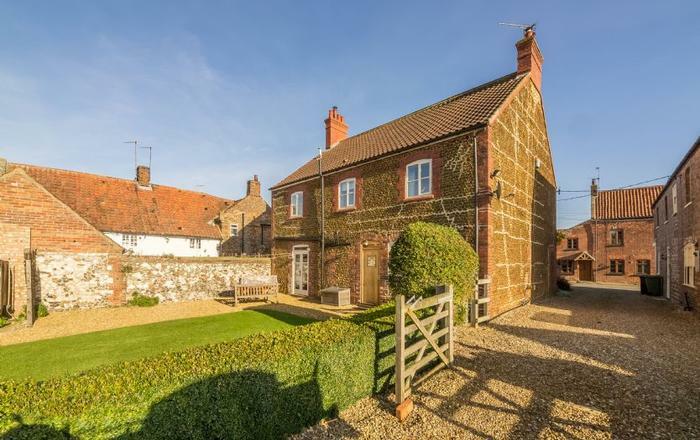 Mini-break Rules for this Cottage: A mini-break is a holiday for less than a week and/or may start on a day which isn't the normal changeover day. 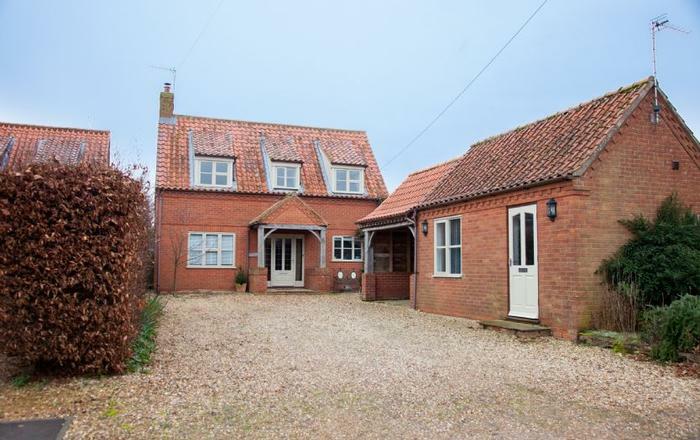 This property owner will only accept mini-breaks at medium notice of 21 days between Easter and October half term. Outside of this time mini-breaks are bookable 56 days before the holiday. 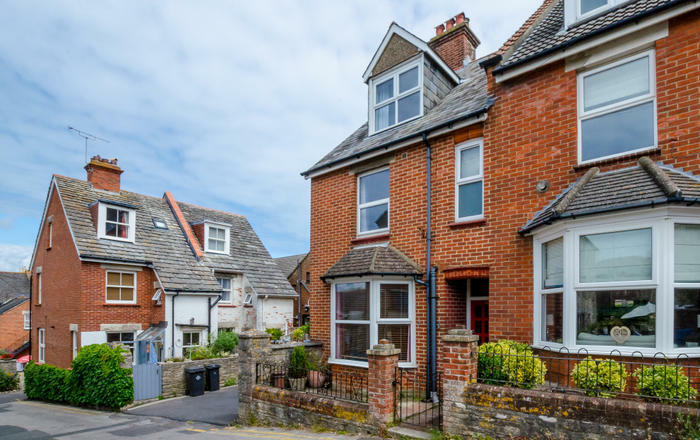 Mr & Mrs D (Oct, 2017): "Location is everything & this flat is certainly the right one! Beautiful. We have loved our stay & hope to be back next year." Mr & Mrs H (Sep, 2017): "A great time, lots to see. We saw a seal from the balcony eating fish!" Mr & Mrs F (Sep, 2017): "Another splendid visit. Weather not so good this time but there is always next time." Mr & Mrs S (July, 2017): "Surpassed all expectations! Had a fabulous time with lots of train tours and pub dinners. Your condo is beautiful and Welsh people so friendly!" Mr & Mrs A (July, 2017): "Stayed here after recommendation. Really pleased we did! Lived up to our expectations. Very nice place. Really good place to have as a base for touring!" Mr W (June, 2017): "Two weeks stay at this gorgeous apartment. Stayed at various apartment on South Snowdon Wharf but this apartment is the best! Will visit again! I dont want to leave!" Mr R (June, 2017): "We have just completed a delightful if very wet week at South Snowdon Wharf. A well furnished apartment in a great location." Mr & Mrs S (June, 2017): "Very well equipped apartment. Best we have stayed in." Mr & Mrs M (May 2017): "This is our third stay in this lovely apartment. Love the location, views, walks, railway & pubs. Sorry to leave but will be back." 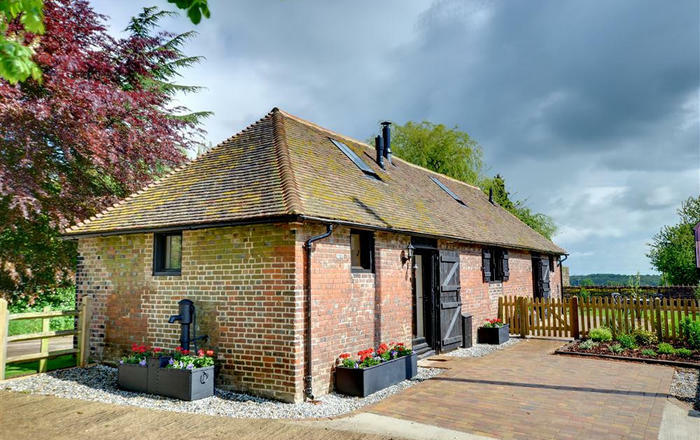 Mr & Mrs B (April, 2017): "Fabulous location, lovely apartment, rested very well. Shame to have to go home. We'll be back. Many thanks." 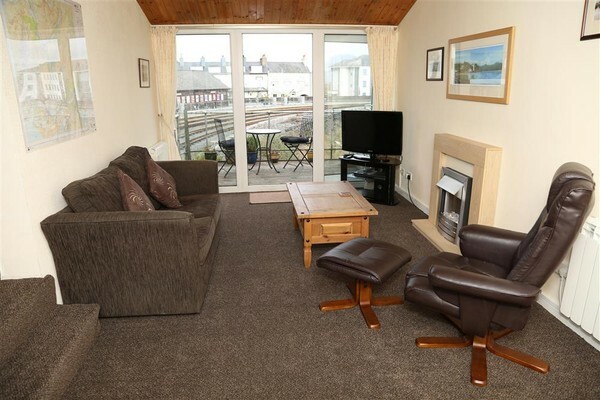 "An attractive apartment overlooking the Ffestiniog Railway and causeway."